Download RRB ALP Admit card 2018 for CEN 01/2018 Know Exam Date & City:- Railway Recruitment Board (RRB) will be conducting Written exam for Assistant Loco Pilot and Technician vacancies which were advertised in CEN 01/2018. The total no. 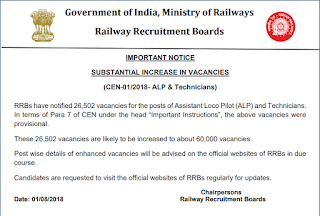 of posts were 26502 but now as per latest notice by Railway on its RRB websites, the vacancies are likely to be revised to 60000. This will be a great opportunity for all those who had applied for this recruitment. 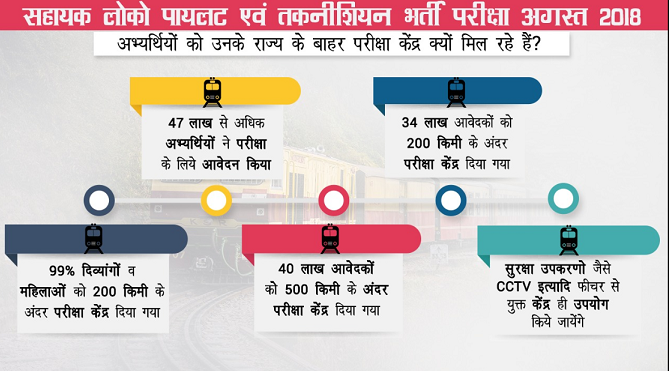 It increased their chances of getting a govt job in Railway. RRB ALP Admit card 2018 is available for download from 05 August 2018. Exam Date and City can be checked now from below link. 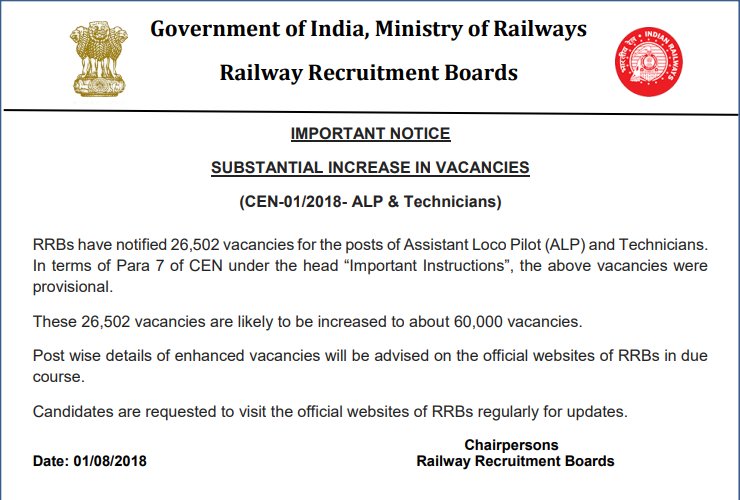 Total 47 Lakh candidates have applied for RRB ALP Vacancy 2018. Earlier the vacancies were 26502. But now they are likely to be increased to 60000 as per new notice by RRBs. Indian Railway Recruitment Boards will take CEN 01/2018 Computer Based Examination starting from 09 Aug 2018. RRBs will release CBT E-Call letter just 4 days prior to examination i.e. 05 Aug 2018. The exam city, date and session of the candidate can be known by entering details from 26 July 2018. The Computer Based test will have 75 objective questions with a time limit of 60 minutes (80 minutes for eligible PWD candidates accompanied with scribe). There is negative marking of 1/3 for each incorrect answer. 20 Questions are to be asked each from Mathematics and General Science. 25 Questions are to be asked from General Intelligence & Reasoning section. 10 Questions will be from General Awareness & Current Affairs. You can download Railway ALP Admit card from below link from 05.08.2018. But now, you can check your exam city, date & time etc. details.